How is a School Library Like a Kitchen? | whitespace. In early 2012, Gould Evans began a partnership with Lawrence Public Schools (USD 497) to modernize and expand their elementary schools. 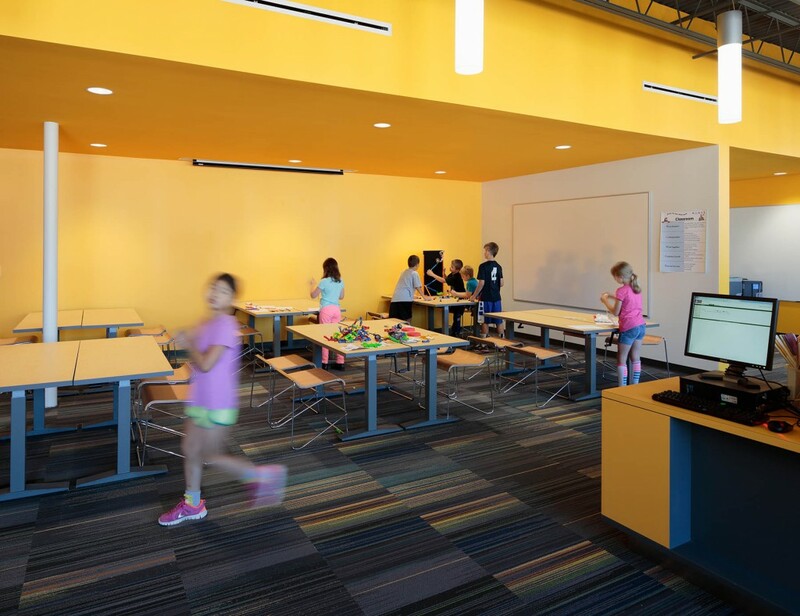 They were at the entry level of initiating a 21st century approach to personalized learning and needed facilities that could respond to their innovative learning model. The school libraries were viewed as the centerpiece of this vision – places that could be transformed to manifest the ideals of a cross curricular, hands-on learning approach while augmenting classroom instruction with spaces and resources not otherwise available in the classrooms. Early on, the district was sharing its vision for the role of the library within a 21st century school. 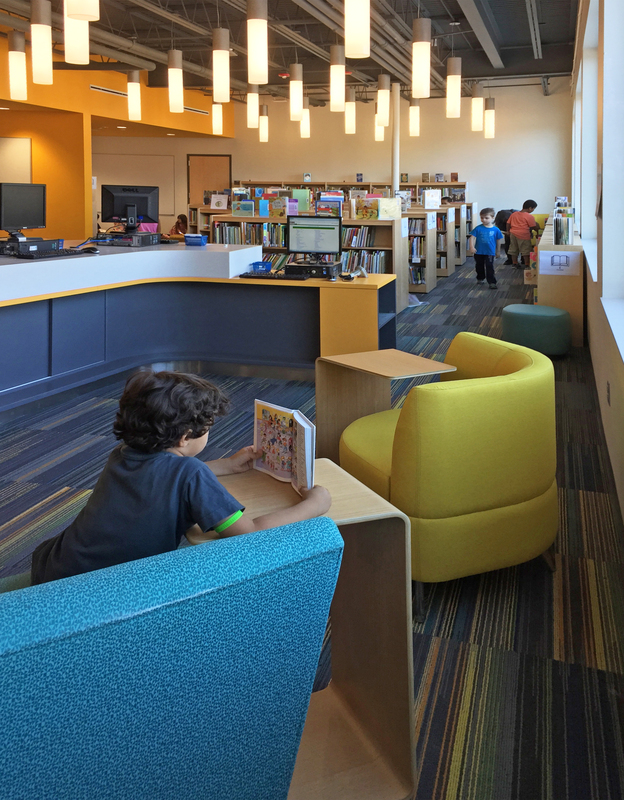 “The libraries should be less like a grocery store and more like a kitchen,” said Angelique Nedved, Assistant Superintendent of Teaching and Learning. This analogy gave us a strong idea about how the district wanted the libraries to function within their respective schools. But aside from this initial declaration of creating a flexible laboratory for hands-on creative learning, what else was important to understand about the future of the K-6 library? We set out to gain a better understanding of this question with an extensive “literature review” of the research happening around the world pertaining to early readers and elementary aged-children. A few highlights from the review are included at the end of this post. 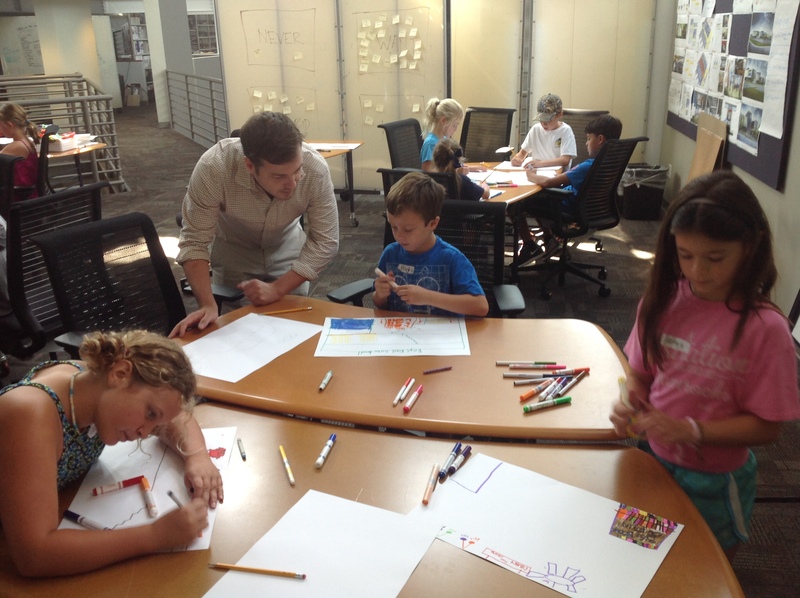 We also conducted empirical research by holding focus groups in our studio with the children as the librarians. Through STEAM Studio, our in-house experimental classroom, we hosted a workshop with 3rd & 4th grade students, asking them to ideate, design, and model their “Dream Library”. It was a “no-holds-barred” creative free-for-all! 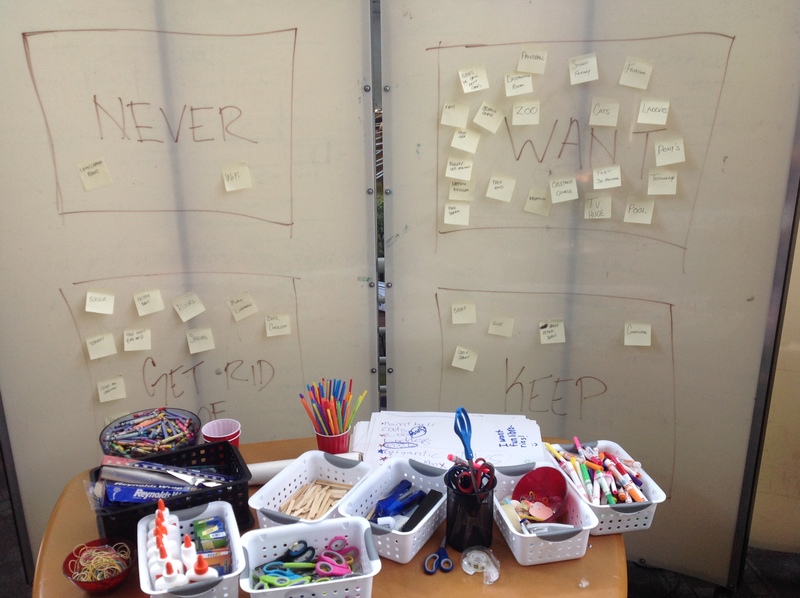 An idea board from the “Dream Library” exercise (photo credit: Gould Evans). A “wordle” created from the “Dream Library” exercise (credit: Gould Evans). One of the big surprises was their lack of interest – even aversion to – technological gadgetry. Another was the request from multiple students for long-term check out and free books – yes, they still love books! There were also many original ideas that had legitimacy in a future school library; a telescope on the roof, a big screen to show book-based movies, themed areas that would make the Dewey Decimal System more visually identifiable (with separate environments for various book themes), and a ‘Big Book of Fun’ (found in the ‘Fibrary’ – the Fun Library) – this book would be authored by multiple authors about all things fun. 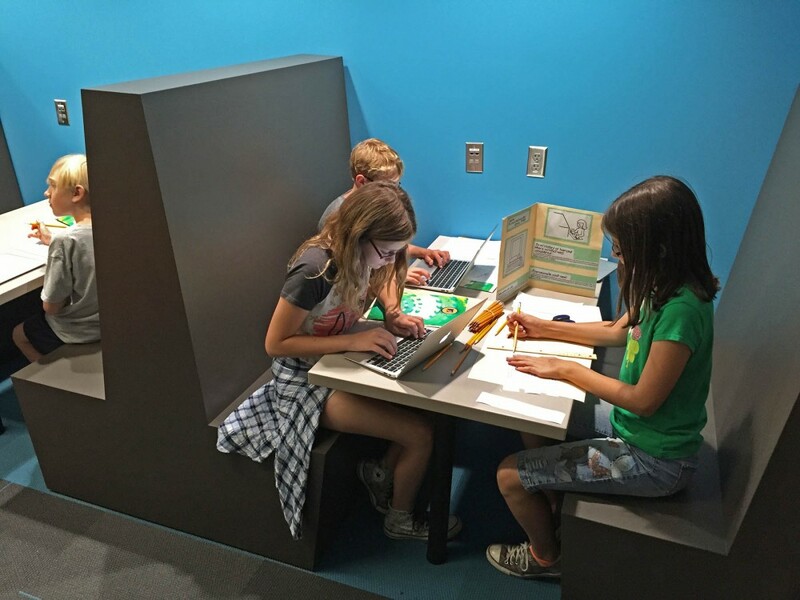 Kids working on the “Dream Library” exercise at STEAM Studio, our in-house experimental classroom (photo credit: Gould Evans). Kids want to be moving around-A LOT! A majority of their ideas are about learning in motion. It’s difficult to keep students engaged…it takes A LOT of work (and non-stop entertainment). Our design team broke down and went across the street for a beer afterwards! With project-based work, more space is required to spread teams out and ensure that teachers have access to student tables. Children are easily distracted – even ordinary swivel chairs become amusement park rides. In the design of their spaces, it’s important to strike a balance between fun and focus. A design that identifies where things belong so kids know where to put them away can make clean up time fun! Many kids “don’t like school” because of what they think it looks like…BORING. Surprise them by making school look FUN! Integrate more making into learning to retain kids’ attention. Working in 3D was the most engaging part of the “Dream Library” workshop. Kids were intimidated by the model building exercise at first, but once engaged, they didn’t want to stop! There is physicality in reading books—turning the pages of a book is like leaving footprints on a trail—there’s a rhythm to it and a visible record of how far one has traveled. This makes it easier to form a coherent mental map of the text. Compared to paper, screens drain more of our mental resources while we are reading and make it harder to remember what we read. The human brain perceives text in its entirety as a kind of physical landscape – reading encourages us to construct a mental representation of the text in which meaning is anchored to structure. Compared to paper, screens drain more of our mental resources while we are reading, making it harder to remember what we read. Visualization encourages students to listen to the story and create detailed mental pictures about what is happening. Making ‘mind movies’ helps them remember content. Visualizing is an important strategy for students as they move from picture to chapter books, and is especially important in today’s world where everyone is constantly bombarded with sophisticated graphics and little language. Wirth and Bowers Buxton have explored ‘sketchnoting’— to help students encode information into visuals so that the information can more easily pass through the various stages of memory— working memory, the visuo-spatial sketchpad (the mind’s eye), short-term memory and long-term or deep memory. Over-reliance on digital media can cause Computer Vision Syndrome (CVS); eye strain, headaches, fatigue, burning & tired eyes, loss of focus, blurred vision, double vision, head and neck pain. While there are no long lasting serious health implications, CVS can lead to earlier need for corrective lenses and occasional eye strain and headaches. The majority of digital libraries were not created for young children. To access these libraries, children commonly need to negotiate complex text keyword searches. Few libraries offer visual browsing of information in addition to querying, so that young children can explore freely. Children differ from adults in the way they choose to organize and present the information they have found. Children love the process of exploration. In the course of the research we found that children want a way to visually explore information. Therefore, we decided to make a library for children that enables them to visually explore information as part of a zoomable user interface (ZUI). Cordley Elementary students work on multi-media projects in their newly-renovated library (photo credit: Aaron Dougherty). The Kindle, with its graphic format, tends to draw in reluctant readers. Once they’re drawn in, reluctant readers come back for more. There are a variety of weaknesses related to digital books: a.) dependency on electronic features, b.) inhibit independent decoding of text, c.) over-reliance on electronic features hinders literacy development, d.) attention is focused more on graphics than text. Integrating Technology; In a recent research project, children in a control group were given only standard Head Start curriculum. Others used computers and standard curriculum. Students using both media performed better on measures of readiness and cognitive development. Students using computers at school and home performed better yet. Hands-on activities play an important, but controversial, role in early science education. Critics of hands-on activities argue: they make learning less efficient and effective by producing confusing and inconsistent feedback; by allowing learners to engage in off task activities that produce irrelevant information; by providing inadequate mappings between behavior of physical materials and their abstract representation in formal diagrams and equations; hands on activities tend to have higher logistical, financial, and temporal costs when compared with other approaches to science instruction. (Hodson, 1996) On the other hand, in a recent study, seventh and eighth grade students assembled and tested mousetrap cars with the goal of designing a car that would go the farthest. Children were able to learn as well with virtual as with physical materials. Depending on how they are used, multimedia projects can provide a motivation for learning or an alternative to traditional assessment that can be very meaningful and engaging to today’s media-savvy students. These projects can encourage teamwork and cooperation and offer an outlet for student creativity, while also arming students to critically engage with multi-modal texts in authentic situations. Viewed historically, children’s books give us the record of each generation’s hopes and dreams. If you want to know what any literate society cares about, you have only to look at the books it has given its children and teens. A copy of Harry Potter and the Sorcerer’s Stone was sent to American reviewers—complete with a letter predicting the book’s reception will be “magic”—Harry Potter represents one of many children’s books that have transformed popular culture; the New York Times created a special children’s best-seller list after the success of the J. K. Rowling novels. Books including Pippi Longstocking, Huckleberry Finn, The Diary of Anne Frank, and Are You There God? It’s Me, Margaret are all part of a collection known for censorship, showing how children’s books are not always simple, innocent works, but can actually become lightning rods of controversy. We’re always interested in the latest thinking about how kids learn and retain knowledge, and their implications for the design process. If you have additional insights in these areas, please feel free to share them!